UL1000 is a unique underwater luminaire, designed to illuminate vividly, efficiently and above all reliably the highest water features. Its rock-solid housing is made of superior quality, highly durable, corrosion & impact resistant AISI304 stainless steel (or 316 on request) and with power consumption of 93W in RGB and 180W in White color, it becomes perfect value for money when it comes to tremendously powerful, yet “green” illumination. 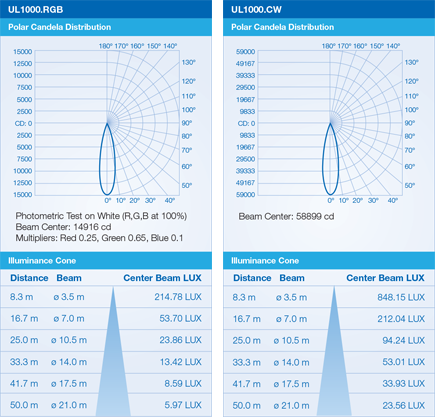 UL1000 incorporates 45 High-Power LEDs made by Cree, Inc. (USA) which provide 58.899 candelas in white & 14.916 candelas in RGB with the standard lenses, and by choosing the optional spot lenses the light intensity goes up to phenomenal values of 235.435cd & 59.626cd respectively. It is a Class III luminaire, CE certified, offering IP68 protection degree. It can be connected on any voltage between 10-30V DC without affecting intensity and it is available in RGB, Cool & Warm White. Standard models ship with 3 meters of waterproof chlorine-resistant cable. 288 Lumens per LED. 1427 Candelas per Watt. We managed to squeeze out 288 Lumens from every single LED chip – an industry unique value. This way, you can achieve perfect illumination of higher fountains by using smaller, more efficient luminaires. The housing of UL1000 is made of pure, heavy-duty Stainless Steel to withstand the harshest conditions, day-in day-out for decades. It is designed to protect the light source from corrosion, aggressive water and impacts, requiring minimal maintenance and always looking brand new. The exceptional waterproofing offers IP68 protection degree for up to 2m / 6ft water depth. All luminaires incorporate cutting-edge microprocessors that constantly monitor the luminaire’s status & temperature, and at the same time communicate with the controlling device receiving and interpreting data about ID, color and intensity. As complicated as it might seem, the whole network works by itself. You don’t have to worry about voltage drop, over-voltage, polarity, over-heating, internal or external interference. Everything Just works. All you have to do is enjoy the limitless spectrum of 16.7 million colors. UL1000 can work under both 12V and 24V DC and anywhere in between without affecting light intensity. It also provides a 10% margin for voltage drop and over-current. And since the controlling information travels digitally within the same 3-wire cable, you can have a phenomenal cable length of up to 200 meters between the controller and the lights. The magic with TheSmartLEDs is that they require just a simple 3-wire cable to operate (no shielding required). The two wires are used for current and the third one is used for sending and receiving led:bus data. This drops cable costs by 25% and also makes installation much easier. UL1000 thinks for itself so you don’t have to. If the temperature inside the fixture rises for any reason (e.g. operating outside of water), the microprocessor will gradually dim the light in 16 steps in order to cool down instead of just switching it off. This way, your fountain will keep being illuminated and the luminaire’s life-cycle is extended. A major drawback of low-end LED luminaires is the flickering effect created on the fast-moving water surface. Apart from annoying, this effect can cause serious health problems to spectators. We have eliminated this issue by utilizing special electronics inside the luminaire, raising the frequency to non-conceivable levels. UL1000, just like any other Fontana underwater luminaire offers exceptional, long-lasting waterproofing. The ingress protection degree of UL1000 is IP68 rated and certified for up to 2m / 6ft water depth. In addition, UL1000 is CE certified. Would you believe that by excessively illuminating your fountain would actually save you up to 96.7% on energy costs, minimize your CO2 footprint and save hundreds of trees per year? We tried hard to achieve this. The most powerful underwater LED luminaire in the world. White 6000K: 12.975 lm | 58.899 cd at b.c. To include one of the following options, add the approriate suffix to the end of the Part Nr. The Pro Power Supplies are made to withstand extraordinary conditions and keep working for decades. Easily control led:bus RGB luminaires. You can create your own colors or choose between colorful sequences. You can download any of the following files for your own personal use. Information contained in these files might change without prior notice. Also, copy in part or as whole, as well as reproduction, publication or whatsoever are strictly prohibited without written consent by Fontana Fountains. You can quickly ask for a quote through this form. Our sales team will do their best to reply to you within 2 hours (during workdays).